A very quick and easy corn soup. I was searching for an easy-to-prepare recipe which had corn kernel in it instead of ground corn. We had been to a party at my husband’s colleague’s house where he had made this soup. We liked it and here’s the recipe! Mix 2 tablespoons of corn starch with 1-2 cups of water until it dissolves. Keep aside in a bowl. Boil 3 cups of water with vegetable stock added into it. Add the corn starch mixture. Add 1 can sweet corn cream style (I use Green Giant brand). Cook mushrooms until tender in some hot water and add at this stage. Bring to a boil and add a little soy sauce and salt to taste. Very nice and simple to prepare! 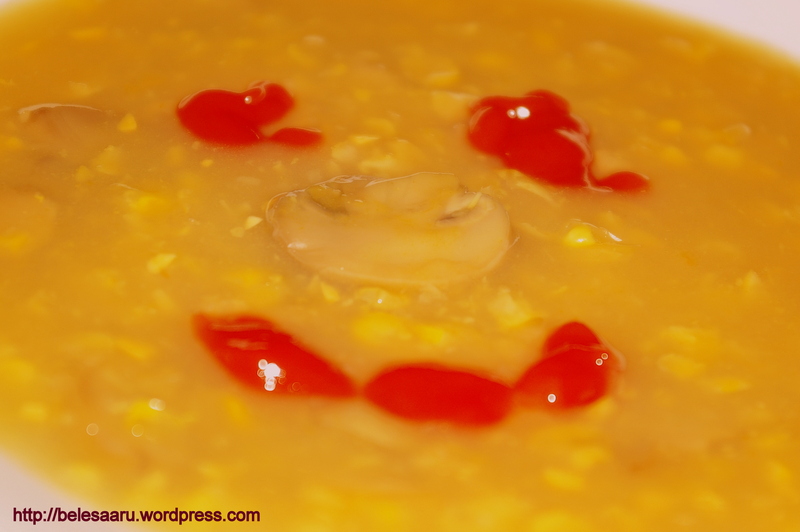 I love sweet corn soup and its really simple.